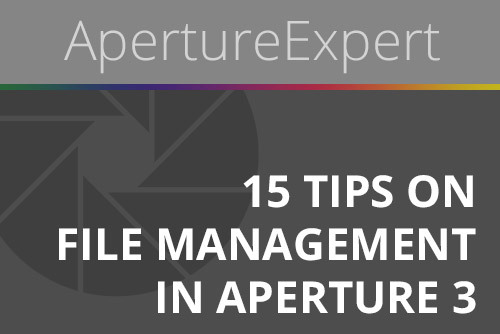 Get more from Aperture’s powerful file management capabilities! Topics include developing your own import, file naming and long-term photo organization & storage strategies, metadata, time zone & time sync mismatches, RAW+JPEG, backing up, finding missing files, and JPEG Previews. Aperture 3 Vaults; What’s Backed Up, and What Isn’t? A user recently asked, “I am realizing that Referenced images are the way to go for my RAW wedding workflow. I don’t know much about Vault. Is this something I use even if my images are Referenced or is this just for Managed images?”. Great question. The Vault can be very useful, but as most users already know, if you’re working referenced, then the Vault doesn’t back up your photos. So what good is it? Learn all about Vaults, and what they do and don’t do in this post. The title says it all… proper tethering support is finally here! No more Hot Folder actions, no more dropped connections (well at least that’s the idea), no more rubbish Canon software, no more crashed Canon mid-shoot. It’s fast and it works. I’ve just tested this with both the Canon EOS 1Ds Mark III and the 5D Mark II, and it’s beautiful. Here we go. A recent post in the forums asked a very specific workflow question, but I’m sure many others have or will come across similar workflow needs, so I wanted to respond to the question as a tip. You have basically two choices when you import—to import all, or to import some. And there are several tools to help you import just the ones you need. The first is easy, of course. To import all, it’s as simple as inserting a memory card into the reader, selecting (or creating) a Project to import them to, and clicking the Import Checked button. However he’s asked about importing selects. That means there’s two stages to importing; viewing the photos to choose which ones are worth importing, then selecting only those images for import. Aperture 3 added some really great features to the Import window to facilitate this, so let’s take a look at those. Check Out The New “User Tips” Section! I’ve just created a new “User Tips” section to this site (look for it in the toolbar), where readers like you can post your invaluable Aperture tips for the community to enjoy. Head on over and check it out, and be the first to post! My first suggestion for a new topic would be on migrating from iPhoto… I know a lot of users out there have done it, and I haven’t! So let’s hear what you went through, what went right and wrong, and help out some newbies in their migration. Understanding Previews and Thumbnails in Aperture can greatly enhance your experience. This is one of those “the more you know…” topics. Do you need to know this? No… Aperture is designed so that you don’t have to think about it. But if you do know it, then your overall understanding of Aperture will go up several levels. Lately I’ve found that I’m spending more time responding to questions in the forums than I am to writing posts in “Tips & Tricks”—which in itself is fine, except that unless you’re digging through the forums (which I’d imagine you’re not unless you posted a question there), it looks largely like I’m ignoring the site—which isn’t good! Thomas Boyd takes us through creative image enhancement using Aperture 3, showing his own personalized techniques that he uses every day. A while ago I mentioned on TWiP that I was looking at a possible solution for wireless tethered shooting with Aperture and the Eye-Fi card. Basic “just shoot wireless” is easy; that’s what the Eye-Fi card does. But we still have to get the photos from the desktop into Aperture, and we all know that transferring RAW files over the WiFi is painfully slow, so my goal was to utilize Aperture 3’s ability to match JPEG to RAW files, and to shoot wireless-tethered and have just the JPEG files transfer, then match the RAW files later on when you can connect card over USB or Firewire. Got it? Good! Oh there’s a good tip post topic. Backup strategies. It would appear that I’ve been targeted by some smarmy disgusting spam-bot creature. Unfortunately those of you that have subscribed to updates all got emails about it (and believe me, I heard about it, too). If you’re into photography (and, um, if you’re using Aperture, odds are you are ;-) head on over to my ConfessionsOfATravelJunkie photo blog where I just posted a series of entries on my trip to Singapore, including some photo evolution sequences, and a Screenflow video of a large photoshop composite. If you’re shooting tethered (or wish you could), I’d love to hear about it. How well does it work for you, and what methods are you using? This has been up for a while now, but I never managed to promote it here! I created a 2-1/2 hour “What’s New in Aperture 3” video exclusively for MacCreate. Check out the promo video below, and buy it here. ApertureExpert’s Adjustment Presets Pack #1 RELEASED! 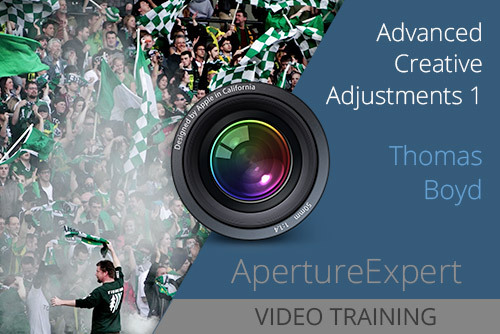 I’m very happy to announce that the Adjustment Presets Pack #1 for Aperture 3 is finally complete! It includes a series of exciting “looks” that are customized in ways I believe haven’t been done before… as well as a series of gradient tints that again have a unique twist to them. These masks are all generated outside of Aperture, meaning that with Aperture alone it would be impossible to create these looks.